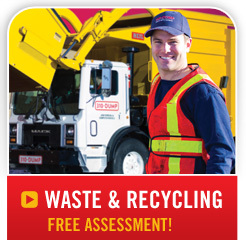 We’re an Alberta owned & operated waste and recylcing company celebrating our 25th year in business! An industry leader in waste and junk removal since 1995. Owner, Greg Kirkwood, founded 310-DUMP while he was still a student at the University of Alberta. He hired some starving students and chased the value equation. Today, 310-DUMP is a symbol of dependability and professionalism in the waste management industry. I am a framer in Edmonton and every builder we work for uses 310-DUMP. They are always professional and curteous while working around us. They are extremely neat and tidy and always place the bin where we tell them to. I would highly recommend this company. The junk removal crew were amazing. I was really impressed to see how fast they worked especially in these weather conditions! I will definitely be telling my friends and family about you guys thank you! Very fast, friendly and efficient. I'm very impressed with the speed and attitude of the junk removal team. 10/10 would recommend to anyone needing junk removal. 310-DUMP was great! They were on time and insanely friendly, the guys work fast. Definitely will be using them again! Online-only deals and special offers are available today for new and existing customers. Switch to your LOCAL waste management provider. 310-DUMP is proudly Albertan! Our company was founded in Edmonton, AB, over 25 years ago and has since expanded to provide full-service junk removal and waste & recycling services throughout Alberta with head offices in Edmonton in Calgary. We service residential and commercial clients, and are committed to providing the very best service at an affordable price. Thank you for shopping local — we'd like the opportunity to earn your business! What would the minimum price cover? The minimum price for our junk removal service covers 1 cubic yard of waste materials that are in an easily accessible area (outside, in garage, on the main floor). What do you do with the items removed? We recycle and donate as much of the materials as possible, items that are not accepted by charities or recyclers are taken to the dump. What does the average bin weigh? We can not determine the weight of the bin until it has been weighed at the dump, the weight can vary depending on the type of material being disposed of. Is there a charge for Disposal? Yes with our Roll off service there is a charge for disposal, the cost is determined by the weight of the contents in bin. 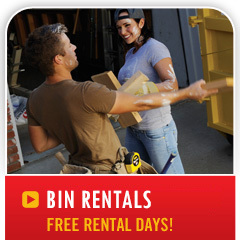 With junk removal service there is no additional cost for disposal other then what is quoted onsite. How do I load the bin? The bin has barn doors so you can walk right into the bin or you can throw the contents over the side. When loading the bin, the contents need to be level with the top of the bin. 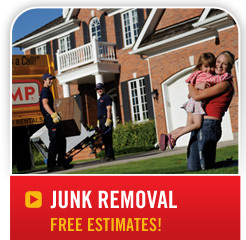 Our estimators will visit you on-site to provide a quote prior to junk removal service. This is a complimentary, no-obligation service we provide to ensure accurate quotes, transparent pricing, and the best possible customer service. You pay based on your needs — how much is loaded determines how much you pay. You won't be hit with extra costs later as all applicable fees are included in the quoted price. From your first interaction with our call centre or online agents, you'll feel the 310-DUMP difference and come to appreciate our fanatical devotion to exceptional customer support. You can feel good about supporting a company that cares about the community. We were founded in Edmonton, AB, and are dedicated to giving back to the communities we serve. 310-DUMP is committed to providing exceptional service at affordable prices. As leaders in the waste management industry, we offer waste and recycling services tailored to the precise needs of your business or home. Not only do we have bins and dumpster rentals available, our large inventory ensures we have the right size available exactly when and where you need it. Recent additions to our inventory include portable toilet and temporary fence rentals. We're always on the lookout for experienced and motivated individuals to join our team! If you're interested in working for 310-DUMP, please reach out to us — we'd love to meet you. In 1995, Greg Kirkwood was studying economics at the University of Alberta and had an idea for a small business that he could run during the summer. Just over 20 years later, he doesn't have a degree in economics, but he does have a thriving and very successful business. What does he owe it all to? Rubbish. When it comes to junk removal, we're fast.